Here's a photo taken about 10 minutes before the performance. 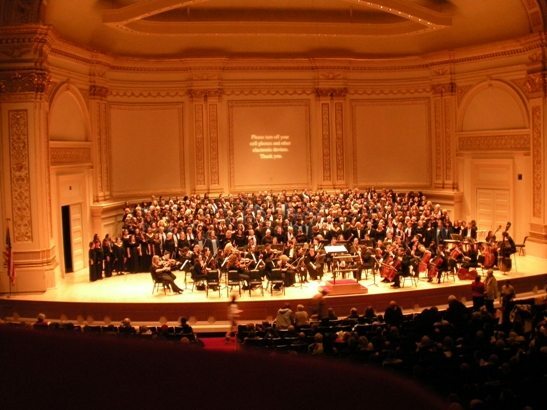 The photographer is unknown as it is illegal to take photos inside Carnegie Hall. I am a founding member of the Peninsula Singers, which is a community chorus that practices in the Community Room at the Hervey Point Loma Library. Recently, we were invited to participate with seven other choruses from around the country at Carnegie Hall in New York City. We started practicing Beethoven’s Mass in C major about a year ago, the piece that we sang in NYC. I believe the chorus has been around for over 6 years. Sarah Suhonen is the Director and Steward Simon is our accompanist. We have performed at the North Chapel at Liberty Station, the Midway Carrier, plus we sing at the Point Loma Library. The chorus is mostly self – funded, plus we receive small donations, and some monies annually from the Hervey Foundation. Our ages range from 18 to 80, with most of us between 30 and 65. We all met up in New York City on Thursday, March 11th and started practicing all together (about 260 singers). We trained with John Rutter for three solid days. It was an incredible happening for all 53 Peninsula singers (we have about 70 members who regularly practice together). There were well over 100 family and friends who also made the trek to New York to support us. By the end of the concert on March 14th, most of our choir was in tears because it was such a moving experience. John Rutter really loves this piece of music and exuded so much emotion in his direction of us. There were well over 1000 people in the audience and they were so supportive. All I can say is that it was a bonus of a lifetime to sing at such beautiful theater and doubly wonderful that we sang for John Rutter. For me, it was one of the most memorable and meaningful events of my life. John Rutter was born in London in 1945 and has had a fabulous career as a conductor and composer. Many well known choral pieces have been composed by John Rutter. He has guest-conducted or lectured at many concert halls, universities, churches, music festivals and conferences in Europe, Africa, North and Central America as well as Australia. WOW very mpressive. I know little about that type of music ….. BUT anytime you can say ” we were invited” and ” Carnegie Hall” in the same sentence thats Something to be proud of !!! I can only imagine what the sense of camaraderie was like. When you get that many people together for a united cause and are able to participate in a piece of music as impressive as Beethoven’s Mass AND you get to do it at Carnegie Hall…. Well, thats about as good as it gets. I wish I had been there. Congratulations. Congratulations! Didn’t even know the choir existed. I’ll be certain to attend a performance the next time I have a chance.